Who am I to deny you what you want? Last month I got such great response from the “technical” article I wrote that I decided to give you another one this month also! You’re welcome! Now try not to fall asleep. Or use this as means of falling asleep if you’re having trouble. There’s variation. Then there’s periodization. With the exception of those members just getting initiated into our training program we routinely change everyone’s routine every 2 weeks on average. We use a variety of training techniques in order to deliver our own special blend of high intensity workouts. And the workouts are staggered (periodized) in a specific way to help drive specific responses/results. Let’s take a closer look at these two concepts so you can further understand why you’re doing what you’re doing. The reason for variation in the exercises performed, how the reps are performed (faster vs. slower, full range of motion vs. zone training, etc), the repetition and set schemes, has nothing to do with “tricking” your muscles. Instead it is an intentional attempt to disrupt homeostasis (def. state of equilibrium). You cannot “confuse” or “trick” muscles into hypertrophy and strength gains. When you nestle under the bar there is no hesitancy or confusion on your muscles part about what they must do—which is contract. And if you’re doing it right, they’re contracting pretty frickin’ hard. And when you work your muscles to exhaustion and finally call it quits, it’s crystal clear to them what needs to happen next. They need to adapt. we know a few things to be true…their evolutionary duty. 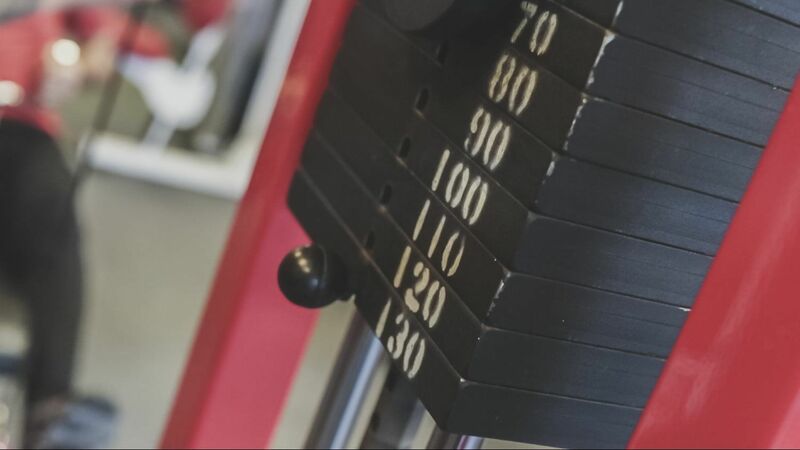 The basic requirements for building muscle, strength, and conditioning are no secret. Challenge the muscles with relatively heavy loads, use enough volume to sufficiently exhaust mechanical and chemical resources, progressively increase training demands, repeat the process frequently enough to maintain and elicit new gains, but not so frequently that you inhibit recovery. BAM! That’s it! Keeping up with these requirements as you develop more muscle and strength, in-and-ofitself creates variation. But you and I know that is not the type of variation implied when we’re told we need to switch things up. But exactly what does that mean? Change some elements—don’t do an overhaul. To get particular result certain training conditions must be met. It’s what we refer to as the S.A.I.D. Principle—Specific Adaptation to Imposed Demands. The idea is not to keep your muscles “guessing” (they don’t sit around between workouts wondering what’s coming next) but to give them exactly what they need to get the result you’re looking for. If the foundation of your training remains intact and in alignment with your objective then varying some of the elements can help enhance results and circumvent plateaus. Most of us just want to look better naked, right!? So we don’t need to plan our training around a competition or athletic event, unless we are actually doing one. But that doesn’t mean we shouldn’t plan/cycle our training. The purpose of periodization is to vary our training demands to get a specific result in a given time frame and to avoid pushing our recovery to the, point of slow return. 1. Each will tax our energy systems differently or rely more heavily on one system over the other. 2. Some will be better at developing raw strength, others will be better at developing muscle, and others will burn more calories or do more to improve our conditioning. 3. Certain routines will be systemically draining (especially on the central nervous system) and take longer to recover from and some will be easier on the CNS and recovery time is faster. 4. All will be painful because, that’s just we do—but some will be more so than others. With this in mind the goal is to work on every aspect of strength, muscle development and general conditioning either exclusively or partially, and give the body adequate time and ability to recover from one routine to the next. Our program is built around a 24-week macrocycle. It is further broken down into three 8-week mesocycles. Every eighth week we do an assessment (for 1-on-1 and Trio Training members) that consists of 5 exercises and a “lighter” week of training (for everyone) that we call a “deload”. The assessment—which consists of five exercises performed the same way and in the same order—is done to measure progress and determine if the demands of the previous seven weeks are having a positive or negative effect. From there we can determine what, if any, alterations need to be made in the coming weeks. The macrocycle is divided into 1 or 2-week microcycles. Each microcycle consists of a different training method aimed to get a specific outcome. The microcycles are laid out in way that, theoretically, will balance training demands and the results from each microcycle will feed-into and off-of one another. And THAT’S IT in just under 1,000 words!! !